Folder Lock- One of the most preferred security software. Folder Lock – Improved compatibility and some minor bugs have been fixed. Beaverton Oregon – November, 17th, 2017 – This modern world we live in has improved our standard of living to infinite heights, and a lot is expected to happen in the upcoming decade. The boom in science and technology has touched all of us as we all are enjoying the perks of it in our hectic daily lives. Computers, Laptops, Cell Phones, etc. are some gadgets that are very common today, and it seems quite hard to survive without them. However, life isn’t that easy anymore as the gadgets we use aren’t safe at all. Also, if you’re in possession of some data that is confidential or dear to you, then it’s better for you to use additional security software known as Folder Lock to protect your files, photos, videos, documents and more stored on your multiple gadgets! Folder Lock is an improved data security software that encrypts your files and maintains an automatic/real-time backup of your files and folders. Furthermore, Folder Lock lets you create Encrypted Wallets to protect all your banking related information including ATM Pin codes, credit card details and more. It also lets you create and convert lockers into portable lockers which means, you may take your encrypted files wherever you want either in USB or other External drives. Other features of Folder Lock include file shredder, history cleaner, and much more. Another important point is that anyone can recover your deleted files from your PC without your consent. However, the ‘Shredder’ is an important feature of Folder Lock that deletes your unwanted files permanently leaving back no traces. It also enables you to shred the empty drive space to make sure nothing is left, and everything is deleted. You may also create a real-time backup of the encrypted files directly on the cloud. If you’re in possession of some portable devices (Flash drives, USB drives, etc.) and want to protect them, then look no further as Folder Lock is well equipped to do so. 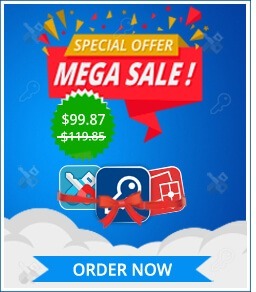 Moreover, this software is perfectly compatible with 32-bit and 64-bit versions of Windows 10/8/7/XP. To give you a sense of relaxation, we would like to tell you that all your files/folders stored in ‘Lockers’ are protected under AES-256 bit on-the-fly encryption. Furthermore, you don’t need to decrypt your files whenever you access them and can later restore files at any given time.